PhraseFinder is a browser extension that should greatly enhance your web browsing. The application is advertised at phrasefinder.com as “the best study tool”, and it seems that many computer users trust this information, because the app is now vastly spread across the web. Of course, this is not the only distribution method that the developers of the app have employed. Due to all this, it is not that surprising that so many users are trying to remove PhraseFinder from their operating systems. There are many suspicious applications that work in the same manner as PhraseFinder. These apps include Highlightly, Quiknowledge, SearchSnacks, and WordProser. We believe that users should delete all of these programs from their operating systems, because none of them are identified as reliable or highly useful. If you delete these programs, you will not have to deal with the tracking cookies, the unauthorized connection to the web, and the suspicious PhraseFinder pop-up advertisements. The files that are used to control PhraseFinder are all signed by PHRASEFINDER, and if you remove them, the app will not be able to communicate with remote servers and display online advertisements. Of course, you would delete PhraseFinder if you decided to remove the files, but you should not waste your time picking and removing files one by one, when you can do that with one click. 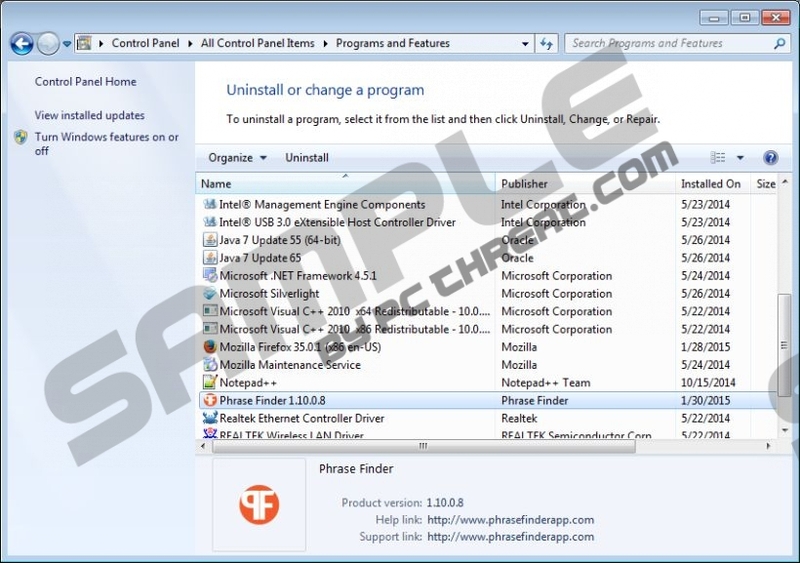 If you follow the manual removal instructions right below the article, you will learn how to uninstall PhraseFinder. To find out if there are leftovers after you delete PhraseFinder, you should inspect your operating system with a malware scanner. Do not be surprised if the scanner detects VuuPC, PriceLess, PicColor, and a bunch of other suspicious programs as threats that you need to remove from your operating system. PhraseFinder could be distributed via Amonetize bundles, in which case it is highly likely that a bunch of unreliable, or at least undesirable, programs will be installed on your PC. Can you delete the malware that has been installed on your Windows operating system? It is unlikely that you will be able to uninstall all unreliable programs. Sure, the manual removal of PhraseFinder is quite simple, but it is possible that you will have to spend more time and put in more effort to remove the remaining threats. To save your time and to guarantee that all threats are deleted (including PhraseFinder) from your PC successfully, we suggest installing an automatic malware removal tool. Navigate to the bottom-right corner of the Metro UI menu to open the Charm bar. Click the Search icon and enter Control Panel to open a menu. Under Programs (or Programs and Features) select Uninstall a program. Select Control Panel to open the menu presenting different utilities. Select Uninstall a program and find the undesirable application. To open the Start menu, click the Start icon on the Taskbar. Select Change or Remove Programs if the menu does not automatically show up. Identify the undesirable application, click it once, and choose Remove. Quick & tested solution for PhraseFinder removal.